Drama thrives on too-small spaces. Pressure-cooker rooms, where conflicts simmer, are the stage for everything from Pinter’s comedies of menace to Alistair McDowall’s domestic-scale sci-fi in X. And in A Streetcar Named Desire, Tennessee Williams adds real to metaphorical heat. It’s a play in which climate is crucial, as the three central characters stew in the stifling humidity of a long New Orleans summer. The Royal Exchange, with its stage tightly enclosed by the audience, should be the perfect arena in which to evoke the sticky claustrophobia of Stella and Stanley’s two-room apartment, the precarious sanctuary of vulnerable visitor Blanche DuBois. Yet the spatial dynamics of Sarah Frankcom’s production are oddly inconsistent. The stage, partially divided by white fluorescent strip lamps, presents a space of fluid boundaries. The only actual wall, separating off the bathroom where Blanche sequesters herself for much of her stay, is a transparent glass partition. Privacy co-exists with exposure. Inside and outside become tangled up in one another. It’s a gesture, perhaps, towards the dissolving boundaries of Blanche’s mind and the regular intrusion of past into present – as well as a choice that ushers the wider world into the space of the Kowalskis’ apartment. Because of course Williams’ narrative is not only about this one troubled character; Blanche’s experience resonates with much bigger questions about mental health and sexual politics, both of which remain the subject of heated public discussion. What this loose spatial interpretation sacrifices, though, is the tension that drives the plot. The suffocating Southern heat of the play need not be portrayed realistically – after all, Williams himself was interested in pushing at the edges of stage naturalism. Productions like the Lyric Hammersmith’s Secret Theatre version (the memory of which is hard to shake) have managed to reject any attempt at creating the illusion of Stella and Stanley’s cramped home while maintaining the same taut tension beneath a new theatrical metaphor. But Frankcom’s production struggles to find a substitute for what it jettisons. When Stanley first explodes and violence ruptures the play, it feels choreographed and clinical rather than charged with real threat, a pattern that is repeated with other moments of conflict. We never really feel the heat or the menace. The production teems with choices that are intriguing but somehow a little unsatisfying. The smooth green carpet of Fly Davis’ set is evocative of the poker table, lending the same air of chance and risk to the narrative as that of the game Stanley and his friends gather to play in the apartment. This could be read as a world ruled by the whims and gambles of men, although this is more a gentle suggestion than a bold interpretation. The same goes for the haunting Day of the Dead-style apparitions that linger intermittently at the edges of the stage, seen only by Blanche. There’s a distinct air of decay about these figures, clad in black and garlanded in funereal roses, as well as a troubling hint of exoticism. Other than acting as a symbol for the death that Blanche has seen so much of, though, their role remains unclear, and stylistically they feel at odds (perhaps intentionally) with the rest of the aesthetic. 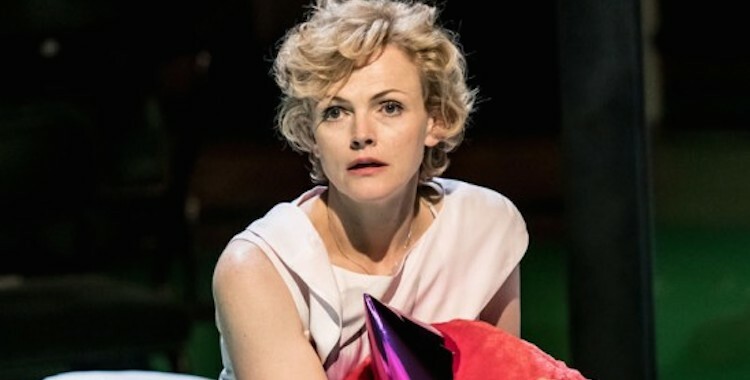 Maxine Peake’s Blanche, like the production around her, is rich with contradictions. The complexities and ambiguities in her performance, though, add nuance rather than clutter. Lesser interpretations can cast Williams’ tragic heroine as a fragile, eyelash-batting Southern belle, always on the trembling brink of breakdown. But this Blanche is capable of being as cold and cutting as she is vulnerable. Dismissing Eunice on her arrival, or trying to persuade Stella to leave Stanley, her drawl drips with irony and scorn. Only the slight quiver of her hands – never overplayed – hints at the emotional turmoil she disguises with liquor and furs. It’s fascinating to witness the hardness as well as the romance in this imagining of Blanche. We see a woman who, although forced to ask for help and rely on others, has long been fighting a solitary battle for survival. She’s tough, in her own way, even if her toughness takes the form of floral dresses and calculated flirtation. This drive to keep going, though, is at war with her inability to let go of the past. Peake plays Blanche with a brittle poise, the unshakeable ghost of aloof gentility and pretended primness. Even her clothes locate her in a different era from her shorts and vest-clad hosts. Making up the central trio, there are also surprising touches from Sharon Duncan-Brewster and Ben Batt as Stella and Stanley. While the rendering of their relationship lacks something – that electric pull that Stella talks about doesn’t entirely convince – each interpretation finds new facets in the character. Duncan-Brewster is a disarmingly chirpy Stella, her vast reserves of optimism bolstering her turbulent relationship with Stanley. There’s also a strong sense, though lightly conveyed, of her shared past with Blanche – and a suggestion, in just the hint of a rolled eye, of sibling rivalry and resentment. Batt’s Stanley, meanwhile, is most striking at his most desperate, almost wringing out sympathy as he howls Stella’s name, wrenching up the two syllables from the depths of his gut. But really, to deploy a tired yet entirely apt phrase, this is Peake’s show. There are moments, towards the end, when even her carefully judged performance veers towards the hysterical – an all-too-familiar choice in Streetcar’s closing scenes. Save that one misstep, though, hers is a compelling and impressively fresh take on an iconic, baggage-laden role. She’s a performer who inhabits a character with every last muscle; sometimes, watching her, you’d swear even her hair was acting. Emotion is conveyed as much by a flicker of the fingers as by a tremor in her voice. It’s hard – as Frankcom’s production, despite all its interest, demonstrates – to discover convincing new stage metaphors for such a well-worn play. Peake, though, finds a way to present Blanche to an audience as if we’d never seen her before.